July, 2015: Metropolitan Joseph, Patriarch John X, and The Very Rev. Dr. Chad Hatfield at St. Vladimir's SeminaryOn September 14, 2015, the Board of Trustees and Faculty of St. Vladimir's Seminary will bestow a Doctor of Divinity degree, honoris causa, on His Eminence Metropolitan Joseph, at an Academic Convocation beginning at 7 p.m. St. Vladimir's will also award an honorary degree to His Beatitude the Most Blessed Tikhon, primate of the Orthodox Church in America (OCA). 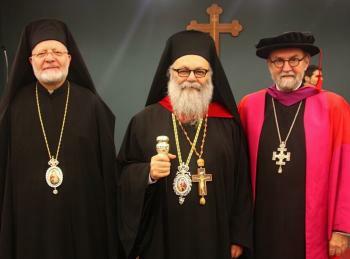 Metropolitan Tikhon serves as President of the Seminary and Chair of its Board of Trustees, and Metropolitan Joseph serves as Vice Chair of the Board. The event is open to the public and will be held in the Metropolitan Philip Auditorium of the John G. Rangos Family Building. 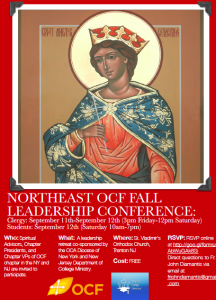 Orthodox Christian Fellowship (OCF) is inviting all of its spiritual advisors and OCF Chapter Presidents and Vice-Presidents serving campuses throughout New York and New Jersey, to a free-of-charge OCF Leadership Conference Friday, September 11th and Saturday, September 12th, 2015. 4:00-5:30pm clergy only session "Clergy Concerns"
October 28-30: Missions Institute of Orthodox Christianity Conference, "Speaking to Secular America"
Please mark your calendars for a special conference that touches upon an extremely relevant topic for all our churches. 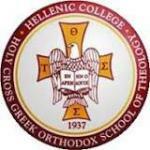 On October 28-30 at Hellenic College Holy Cross, the Missions Institute of Orthodox Christianity will hold the conference "Speaking to Secular America: How the Church is Reaching Out to the Non-Religious of our Society," which will be held in conjunction with the Installation of the 21st President of HCHC, Fr. Christopher T. Metropulos. George Abodeely, 85, died July 30, 2015 (at the Grace House) in Windham NH, with three generations of family members at his side. He was the beloved husband of Constance A. “Connie” (Coury) Abodeely with whom he celebrated their 62nd wedding anniversary on November 14, 2014. He was formerly of Andover, MA and was a well-respected educator in the Tewksbury School system. Born in Lowell, Massachusetts, June 23, 1930, George was the fourth child of the late Michael and the late Nahie (Missad) Abodeely. 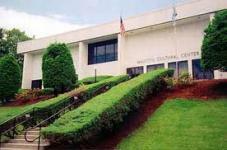 He attended Lowell (MA) schools and was a graduate of Lowell High School in the Class of 1948. He went on to graduate from Lowell State Teacher’s College in 1952 with a degree in Education, and received his Master’s in Education from Fitchburg State University. Later, he received Certification from Boston University’s Guidance and Counseling Institute. Prior to his retirement, George served as Assistant Principal at the Tewksbury Middle School, where he taught for over 24 years. Previously, he served as Guidance Counselor for the Tewksbury School system, and before that as a teacher at the Foster School in Tewksbury. Gregory Abdalah of St. George Antiochian Orthodox Church in Phoenix, shares his experiences with fellow D.Min. studentsSt. Vladimir’s Orthodox Theological Seminary is now accepting applications for students who want to enroll in its Doctor of Ministry (D.Min.) Program and comprise the “2019 Cohort,” which will commence training in Summer 2016. Potential students may explore this innovative residential program that uses distance-learning and onsite intensives by perusing the D.Min. Program page, or by contacting Director of Admissions Archdeacon Joseph Matusiak or Program Director Priest Sergius Halvorsen, Ph.D. for more information. Applicants for the new cohort may also apply for aid, through the Danilchick Family Endowment for Pastoral Studies. The fund, set up by the Reverend Protodeacon Peter M. Danilchick and his wife, Tanya, will help support qualified D.Min. students with their tuition, through need-based scholarships. The editors of Antiochian.org have created an aggregate of the photo galleries published during His Beatitude Patriarch John's visit. Go here to view the collection of galleries, "Convention and Patriarchal Visit 2015." ...and more! Download (PDF) here. As I write this Paschal message, I sit before a seven-foot snow drift. It's not easy to imagine the Easter flowers pushing through the earth to greet the spring sun, when the earth is covered with such piles of snow. It's seven degrees now, but I know that, as Lent trudges on, even with another six inches of snow forecast for this week, Pascha is on the way. How do I know that spring is coming? 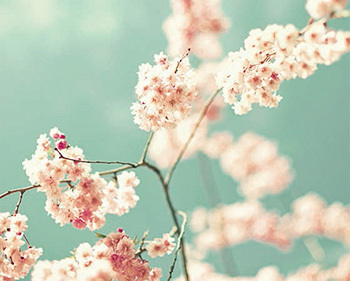 Was it my mother who told me that spring follows winter during those long days inside the house, or was it something I learned in school? Perhaps it was many years living and noticing that each year Pascha followed Lent. In any case, we prepare for Pascha with great anticipation, especially after a record-breaking winter. What I really want to talk about today is becoming comfortable with the seasons of our lives and recognizing God's presence and love in each of these seasons. Each has its own challenges and blessings. Let's rise to the challenges and rejoice in the blessings. After all, this is the day that the Lord has made for us. After all, we were born for Pascha, and all of life and all the gifts are to help us embrace this reality of union with God. is is true whether we are just learning to drive or are experiencing the aches of the rusty years. 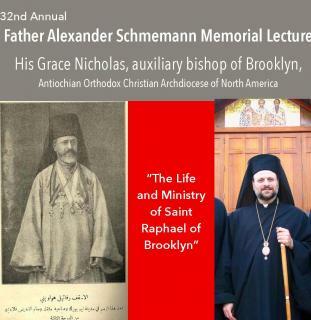 His Grace Nicholas (Ozone), auxiliary bishop of Brooklyn and resident assistant to Metropolitan Joseph, will speak at the 32nd Annual Father Alexander Schmemann Memorial Lecture, Friday, January 30, at 7 p.m., on "The Life and Ministry of Saint Raphael of Brooklyn." 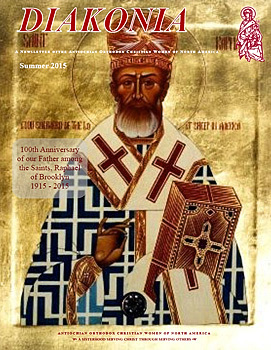 In 2015, the Antiochian Archdiocese will celebrate the 100th Anniversary of the Falling Asleep of St. Raphael with many commemorations related to the Centennial Jubilee. Saint Raphael was born Raphael Hawaweeny in Beirut, Lebanon of Damascene Syrian parents of Greek Orthodox Antiochite-Byzantine origin. Father Raphael was sent to New York City in 1895 by Tsar Nicholas II of Russia to administer the local Orthodox Christian community, which included both Russians and people of the Levant. In 1904 Archbishop (Saint) Tikhon of Moscow and Bishop Innocent (Pustynsky) consecrated him as Bishop of Brooklyn, a position he held until his death. 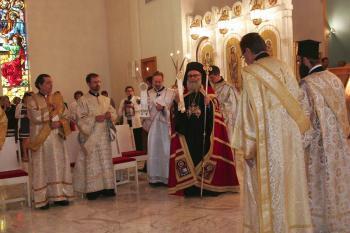 Bishop Raphael was glorified by the Holy Synod of the Orthodox Church in America (OCA) in its March 2000 session. He is commemorated by the Antiochian Orthodox Church on the first Saturday of November. Originally buried in New York, Bishop Raphael's body was translated in August 1989 to the Antiochian Village Camp in Ligonier, Pennsylvania. We regret to announce the repose of the soul of the servant of God and Archdeacon Elias 'Ely' Hamaty. Fr. Ely fell asleep in the Lord on Sunday afternoon 28 December at the Good Samaritan Hospital in Brockton MA, surrounded by his devoted family. Fr. Ely was born in 1934 and raised in the 'Syrian Colony' of Boston's South End. His parents, Mousa and Nour Hamaty were among the early members of St. George Orthodox Church of Boston. The Hamaty family emigrated from the village of Aafsdiq, Al-Koura near the Balamand Monastery where Mousa attended school and later worked as a cook. Fr. Ely's grandparents, Simon and Mariana, also worked at the Balamand Monastery. After arriving in Boston, his parents operated a successful family owned restaurant in the South End. Fr. Ely entered the family business and operated the restaurant before opening his own electronics firm. ELCO Electronics specialized in marine electronics and communications. Fr. Ely was an avid yachtsman and sports angler who fished the waters from Alaska to the Caribbean. Historic Boston Convention: "Something for Everyone"
North American Chair of the Order of St. Ignatius and Boston attorney, Mary Winstanley-O'Connor, will have an eventful year in 2015. Along with co-chair Raymond Sayeg, she is serving as co-chair of the committee responsible for the 52nd Antiochian Archdiocese Convention, which will be hosted by her home parish, St. Mary Orthodox Church in Cambridge, MA with The Very Rev. Antony Hughes. Antiochian.org asked her about the plans for the Archdiocese's "family reunion," which will be held in history-rich Boston, and will be led by Metropolitan Joseph for the first time. 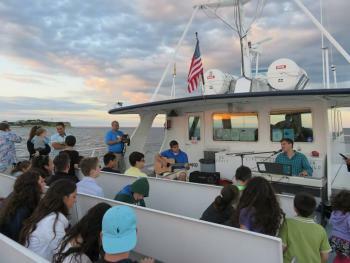 Tell us about your hometown of Boston, and what conference-goers can look forward to this summer? Boston is the cradle of democracy, rich in the history of the founding of our country, and home of the site of the Boston Tea Party. People are able to walk the Freedom Trail, visit the Old North Church from which the lanterns were hung to warn the troops as to whether the British were coming by land or by sea, and to visit the Paul Revere House. 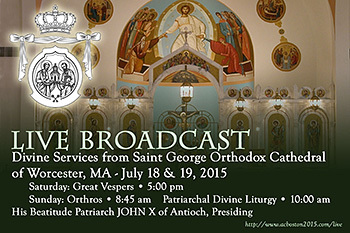 St. Mary Orthodox Church in Cambridge, Massachusetts is proud to host the 52nd biennial Antiochian Archdiocese Convention from July 19 through July 26, 2015, in beautiful Boston, Massachusetts. This historic city's significance in American history is a fitting backdrop as we celebrate our own history of Orthodoxy in America, the 100th anniversary of the falling asleep of St. Raphael of Brooklyn. Making this event even more historic will be the presence of His Beatitude John X, Patriarch of Antioch and All the East, presiding, and the first North American Archdiocese Convention under His Eminence Metropolitan Joseph. For more information, please visit the convention website at www.acboston2015.com, or visit the Convention page on Facebook. MEMORY ETERNAL! Charles Slemon, father of Kh. Sharon Nasr (retired at St. Elijah in Oklahoma City), OK, fell asleep in Christ in Rhode Island on Sunday, October 5, 2014, at the age of 96. 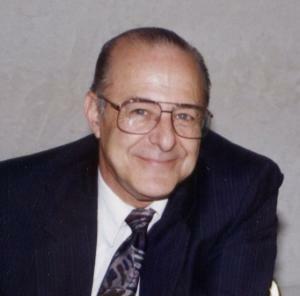 Mr. Slemon will be buried this Saturday, October 11th, from St. Mary Antiochian Orthodox Church in Pawtucket, RI. 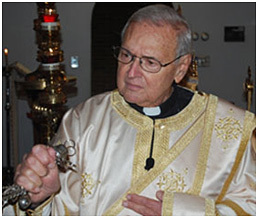 Condolences may be sent to Archpriest Constantine Nasr and Kh. Sharon at revnasr@yahoo.com and sharonnasr@yahoo.com. Please join me in praying a rope for the repose of his soul, saying, "O Lord Jesus Christ, grant rest to the soul of thy departed servant." May he be granted Paradise, and may you be granted long life. The Second Boston Byzantine Music Festival presents a dynamic and engaging collection of performances that explore the musical tradition of the Byzantine Empire and its points of contact with the music of Western Europe and the Ottoman Empire. 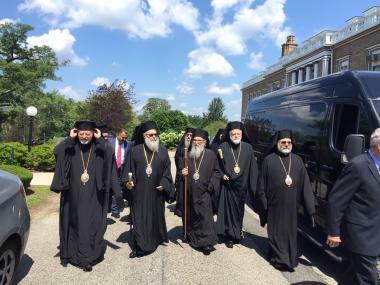 The Antiochian Orthodox Christian Diocese of Worcester and New England held its 76th annual Parish Life Conference (PLC) from June 19-22 at the Radisson Hotel in Plymouth Harbor. 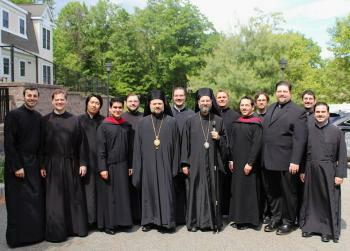 The conference was organized and hosted by the parish of St. George Antiochian Orthodox Church of Boston. The theme of the PLC was taken from the Gospel according to St. Luke; "You shall love the Lord your God with all your heart, with all your soul, with all your strength, and your neighbor as yourself." With over 300 people in attendance throughout the four days, the PLC proved to be a tremendous success. Some highlights included lively question and answer sessions led by His Grace Bishop John (Abdalah) as well as daily Bible studies, divine services and inspirational homilies led by our beloved Diocesan clergy. 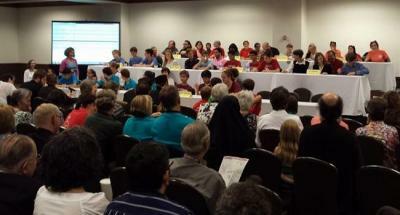 The teens of our Diocese showcased their knowledge and talents at the annual Bible Bowl and Oratorical Festivals. Antiochian.org has assembled a collection of photographs highlighting the Unity Conference. Additionally, the Patriarchate of Antioch's website has published photo galleries and written reports of the historic events in both Arabic and English, and galleries are also available on the Patriarchate's Facebook page. The sizable North American delegation, pictured here with Patriarch John X, was composed of bishops, priests, key department heads, and organization leaders. Members of the group will begin returning home on Monday, June 30. The first two Parish Life Conferences (or PLCs) for the Antiochian Archdiocese have kicked off the summer PLC season with a splash! 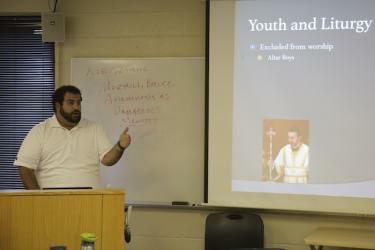 From June 11-14 in San Antonio, Texas, host parish St. Ephraim the Syrian Antiochian Church is overseeing a lineup of events for attendees from the Diocese of Wichita, including talks by Keynote Speaker Sister Vassa Larin, as well as excursions to local attractions such as the River Walk and Sea World San Antonio. Also enjoying water access are the faithful of the Diocese of Miami, who are being hosted on June 11-15 by the St. George Antiochian Orthodox Church of Orlando at the Crown Plaza Hotel, with its proximity to lakes and the Atlantic coast. Met. Silouan, Bp. Nicholas, and St. Vladimir's seminariansCongratulations and many years to all the Antiochian Archdiocese graduates in the Class of 2014! It's time to register for your diocese's regional Parish Life Conference (PLC)! This year's conferences are spread out across five weekends in June and July. On June 11-15, the Diocese of Wichita and the Diocese of Miami will kick off the PLC season in San Antonio, TX and Orlando, FL. Shortly thereafter on June 19-22, the Diocese of Worcester will convene in Boston, MA. Fort Wayne, IN, will be the site for the final June conference with the Diocese of Toledo's PLC on June 25-29. Finally, the Dioceses of Los Angeles and Eagle River, Charleston and New York, and Ottawa, will all meet from July 2-6, combining Fourth of July celebrations with Parish Life Conferences. Visit the Conventions and Conference Planning page for full information. As always, this year's theme, love for God and neighbor, will be the focus of the Creative Festivals, a highlight of the conferences. Youth and organizational meetings, spiritually edifying speakers and services, and social events for kids and adults alike, all make the PLCs one of the Archdiocese's most established and popular traditions. To facilitate your parish participation in the Creative Arts, Bible Bowl and Oratorical Festivals, all resources are available in the Festivals 2014 section of Antiochian.org. Additionally, ads for the souvenir journals can be purchased and registrations can be submitted through the Department of Conventions and Conference Planning's Antiochian Events pages. Bishop Elia to Offer Keynote: "Christians in Syria at the Crossroads"
BROOKLINE, MA—As a feature of the Costas Consultation in Global Mission series, Bishop Elia Toumeh of Wadi Al Nassara will give the 7 p.m. Keynote Address as part of the all-day event "Christians in Syria at the Crossroads," Friday, March 28, 1 p.m.–8:30 p.m. His Grace is a professor at the University of Balamand, Lebanon, and he will speak in the Maliotis Center at Hellenic College Holy Cross. The event also features Dr. Elizabeth Prodromou (Harvard University; former Vice Chair of the US Commission on International Religious Freedom), the presentation of student papers, and the film "Displaced in their Homeland" about Christians in Iraq, produced by Fady Mekhaeel. The 2014 BTI Costas Consultation in Global Mission is presented by the International Mission & Ecumenism Committee of the Boston Theological Institute in partnership with Holy Cross Greek Orthodox School of Theology.